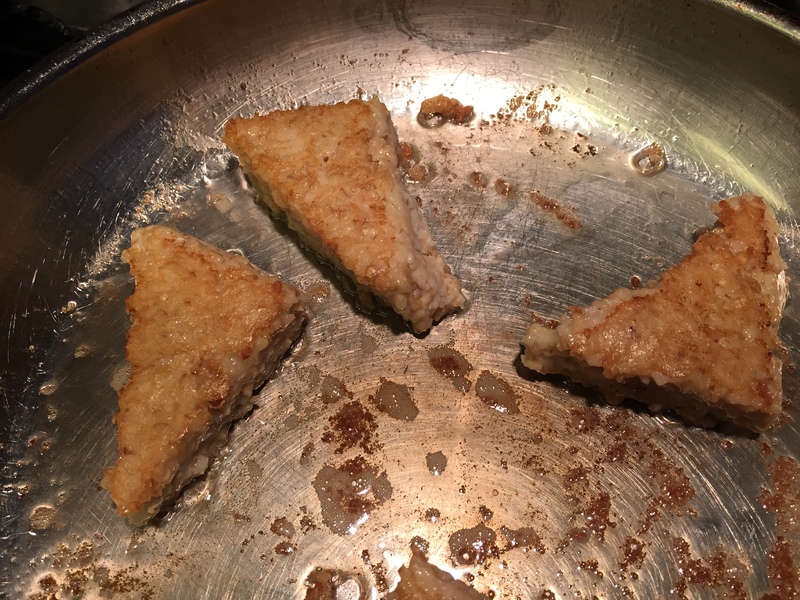 The starch from the oats forms a surprisingly tasty crust. I recently upgraded my rice cooker to a fancy kind that has different cooking modes and temperatures for the best results with various grains. This includes a Porridge mode that is perfectly suited to steel cut oats. I wake in the morning and there are perfectly prepared oats waiting. This is fantastic. The problem is that I don’t know ahead of time whether The Husband will want breakfast or not. If I make one cup of oats, it’s plenty for me and The Assistant, but not enough for all three of us. If I double up and he doesn’t want breakfast, we have a ton of leftover oats. What could I do with the leftovers? This got me thinking: when you have leftover polenta, you can refrigerate it in a pan, cut it into shapes and pan fry it. What about oatmeal? The Assistant is always campaigning for pancakes, waffles or French toast during the week, all of which take much too long. Could I satisfy his craving with oats? Press the leftover oats into a Pyrex dish to give them shape and structure. And that’s it. 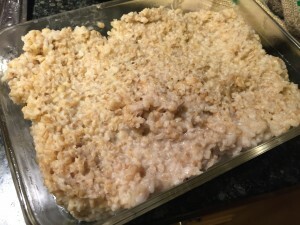 Simple, tasty enough to appeal to The Assistant, and arguably healthier than any of his other “fancy breakfast” favorites.